The Bowerhaus collaboration with Australian global nomad Hermione Olivia indulges us with an exquisite collection, heavily inspired by her adventurous spirit and wanderlust experiences. The charming monochromatic palette showcases marble, onyx and encrusted baroque pearls, for a timeless and effortlessly elegant fashion accessory. 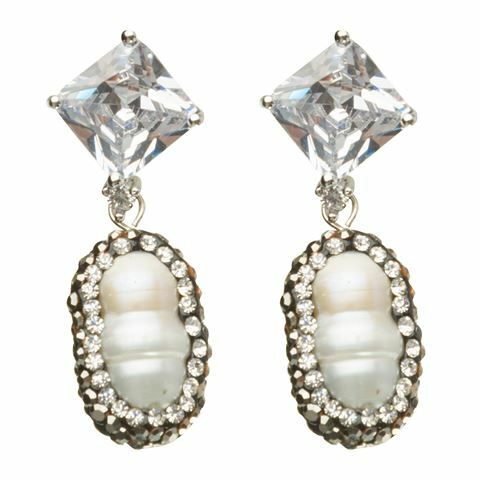 Made from 18mm pave crystal baroque freshwater pearls with cubic zirconia set in a rhodium-plated finding. Pairs beautifully with other Bowerhaus jewellery pieces. Beautifully packaged in a Bowerhouse grey velvet jewellery box.